Paul Millsap is the 13th Hawk to be named East Player of the Week and the first since Al Horford after the week of Nov. 19-25, 2012. 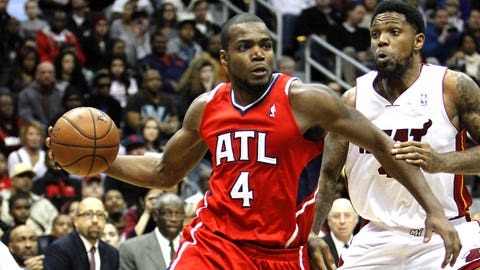 For the first time in his career, Paul Millsap has been named Player of the Week. The Hawks forward earned the Eastern Conference’s weekly award after averaging 21.3 points, 7.3 rebounds, 3.8 assists, 2.5 steals and 2.0 blocks in 31.0 minutes. Atlanta went 3-1 during that stretch. Against the Magic on Jan. 22, Millsap had 24 points, six boards, five assists, five blocks and three steals, becoming the first player in franchise history to ever reach those numbers in a game, and the first in the NBA since Dwyane Wade on on March 25, 2011. For the week, the eighth-year veteran ranked tied for third in the East in free throws made (22), tied for fourth in blocks per game, tied for sixth in steals per game and ninth in points per game. Millsap is averaging 17.7 points, 8.2 rebounds, 2.9 assists, 1.7 steals and 1.2 blocks in 33.2 minutes and is the only player in the East — and just one of two in the NBA — with at least 16.0 points, 8.0 rebounds, 2.0 assists, 1.0 steals and 1.0 blocks. Millsap is the 13th Hawk to be named East Player of the Week and the first since Al Horford after the week of Nov. 19-25, 2012.